Federer v Tsonga - what a match! 1.01 gubbed! 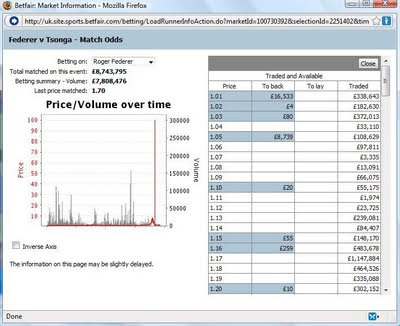 When Roger Federer leads 5-1 in the third set, up a double break, you are entitled to think he is home. A few of the money-buyers will have absolutely soiled themselves over this one. 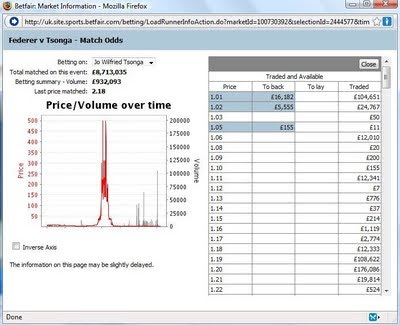 It's currently 3-3 in the final set tie-break, I doubt there'll be any more 1.01 traded! UPDATE - Tsonga wins the tie-break 7-3 and the match 7-6 1-6 7-6.